Are you looking to spend this upcoming Valentine’s Day soaking up the sun, lying by the water and discovering relaxation once again? While searching for your perfect destination I can almost guarantee you’ve come across the Maldives. Those white sandy beaches, plenty of sunshine, freshly caught seafood and sensational snorkelling and dive locations are teasing you to come and visit. All that white sand, crystal-clear water and amazing marine life makes The Maldives that picture-perfect couples’ destination. And no doubt you’ve seen the incredible villas perched out perfectly on the water splattered across your Facebook feed or Pinterest boards. 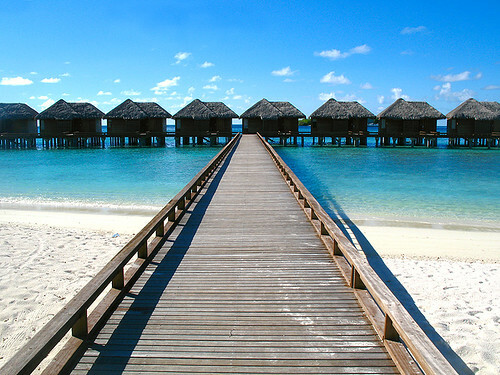 Perhaps one of reasons that the Maldives have remained such an exotic destination is the fact that they are so remote. Apart from a few direct flights from Europe, the only way to get to the Maldives is via another Asian destination, like India, Sri Lanka, Singapore, Thailand or Malaysia. It’s no wonder visiting the Maldives doesn’t come cheap. So, how on Earth can a couple afford to go there for an anniversary, honeymoon or even Valentine’s Day that is quickly approaching? The first advice I would give anyone planning a trip to the Maldives on a budget is to go all inclusive. Don’t be tempted to book a flight just because you think you’ll save a hundred pound. In the Maldives, most of the holiday will be spent at your hotel; if you’re staying in one with overpriced drinks, you have no choice but to pay for them. And trust me, the drinks will most definitely be overpriced as well as all the food, excursions and other things to do on the island. Going all inclusive will seem considerably more expensive at first but at least you’ll know in advance that there won’t be any outrageous fees later on. Also, because of the lack of grown produce almost all of it needs to be brought in (besides whatever may be grown or caught on the Maldives) your best menu choices should be fresh seafood and fruit. You will almost always be restricted to dining options at the hotel you stay at, unless you choose to take a boat ride to another island or take a picnic lunch on an excursion. So once again, aim for the all-inclusive deals as it is uncommon to even find many affordable street food stands or fast food chains. Plus, don’t forget to take advantage of the free things you can do in the Maldives. Spend time on the beach with your loved one, enjoy a romantic sunset, walk through the beauty that surrounds you; it’s free to look and most definitely priceless memories will be made. Then, if you wish to catch a glimpse of a Maldivians’ daily life, how they live and whatnot, look no further than the Male’ Fish Market. That is the commercial epicentre of one of the country’s most important industry—fishing (tourism being the other important industry). You can walk around, get a nice whiff of sea life and even score a nice meal while you’re at it. Just walking around the small capital of Male afterwards is a nice experience as well so take advantage of it.